It’s easy to place blame on outside forces. When someone hurts us, they are to blame and we take some comfort knowing it wasn’t our fault. On a personal level however, we truly are the only person in control and if we refuse to accept personal responsibility we are unable to move forward. Allowing ourselves to be victims for too long is damaging. We are designed to heal. It starts with silencing those thoughts in our mind that give voice to our past, present and future bullies. I was a victim for longer than I needed to be. Rather than find help so I could move forward and grow, I clung tightly to those long gone bullies in school, career failures after college, and unhealthy relationships. Nothing was my fault because the world was too cruel and unforgiving for “pobre mi” to do anything. I stopped trying to succeed and decided to live in the memories of a happy childhood, along with living in a fantasy world of books and movies. This fantasy told the story that someday my luck would change, an important person would point me out in a crowd as a heroine, and raise me up. Even in my fantasy world I wasn’t in control, but instead waiting to be saved. Because only if someone made it easy for me could I finally succeed. I lost any thought that I was in control of my life. In my disillusioned state only someone or something else could help me. I lied about my personal feelings, invested my energy and time in people I didn’t care about or who had little in common with me, and chased the elusive myth that money and things could solve my problems. In fact that is still an obstacle I must fight when life gets rough. I did try for things, but easily gave up whenever it became difficult. I put on a brave face. Oh wasn’t I such a martyr, marching on despite this cruel world that rejected me as a young adult and still didn’t want me to be happy. In reality, I was very sad, socially awkward, and scared. I couldn’t admit to being wrong or people would realize how much of a failure I really was. Terrified of rejection from people that might genuinely like me, I stopped socializing. I jumped from one job and one city to the next with no plan. I burned bridges. I gave up. So I acted like the unintended consequences of my rash decisions were purposeful choices. There was always an excuse or a way out of any problem without putting myself in too much harms way. I felt so alone which only made my depression deepen. While skipping from place to place in attempt at finding purpose I gve up by never trying hard enough. I had taught myself to be a perpetual victim. At the age of 32 and a tumultuous year of loss and change, I decided it was time to learn a new way of living. Personal Responsibility was my first lesson. Below are five lessons I learned about owning up to my actions. 1. You are in control of your thoughts. What you think has a a huge impact on your self-worth. If you constantly think “failure, loser, awkward, weird” in reference to you, that is what life becomes. Change the way you think about yourself, about others, and about your capabilities. Celebrate what makes you feel good and learn the necessary skills for the parts of you that need improvement. Focus on what YOU think needs improving. Don’t listen to those who judge you and tell you what you need to change. *They don’t know what’s best for you. You know what’s best for you. 2. 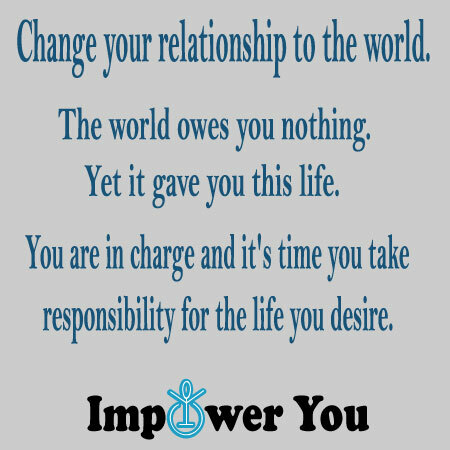 Change your relationship to the world. The world owes you nothing, but it has given you life. Now it’s up to you how to live. You are in charge and it’s time you take actions for the life you desire. What do you perceive as the perfect life? Whatever it is, you need to figure out how to make it happen without waiting to win the lottery or for your boss/partner/friends to realize you deserve better and save you. We are the outcome of cause and effect. What we give to the world is what we get back. Research what you need to get to your dream life, make a plan, and stick to it until you succeed. 3. Ask for what you need. Ask for help. Ask for guidance from someone who has been through what you are going through. If you’re not succeeding in your career find a mentor or shadow someone at work. If there’s a hobby or sport you really enjoy learn how to do it better. and see what opportunities there are such as internships, classes, or books that you can learn from. When I decided to start a writing and editing career it was and still is a learning experience. Before I would give up if I had to put it in too much effort, but now I commit to actually finishing projects. 4. Admit to being wrong. Go ahead try it the next time you make a small mistake. Now repeat that admission a few more times and pay attention to how that makes you feel. Let go of your ego. Let go of the fantasy of perfection. We all make mistakes, some of us seemingly more often than others. That’s okay! Mistakes don’t make you a bad person, but believing you’re worthless will make you act worthless. Teach yourself to apologize, admit when you are wrong, and allow yourself to make mistakes without admonishing yourself. 5. Fight when it matters. Fighting in self defense is good. Fighting to prove you are tough is dangerous. Debating(without yelling and with reason) over politics, human rights, and personal beliefs is healthy. Arguing over the remote control, what movie to see, or who is correct; those are all a waste of energy. Your energy needs to be spent on inner growth, not on changing others. Save your strength for what matters. There will be many times you need to assert yourself and prove a point, but sometimes you need to let go and move forward. Before when I was frustrated, upset or angry I would throw a pity party complete with panic attacks and hours of sobbing. The slightest thing could set me off, be it serious, exaggerated, or simply a doubtful thought. After teaching myself a new way to live I am at a point where I can stop myself from giving up. I do this by reminding myself that life ebbs and flows. What’s bad now will not be bad down the road, unless I insist on moving forward with it. Now I know that I am capable, I remind myself that of my accomplishments and my desires every day with my powerful thoughts. I changed my thinking. I stopped letting every bad moment turn into a week or month long tragedy. I read books and articles about conflict resolution, anger management, and inner peace. I became certified to teach self defense. I started working on a career that would resonate with me, and now I learn something new every day. I used to live in fear, now I live aware. Be conscious of your actions, words, and thoughts. Seek out people who share your passions in life. Get involved in a project that makes you feel good and see it through to the wonderful end. As you focus on what resonates with you more of that will come into your life. I lost 17 years to depression. During those years many days and nights were spent curled into a ball, sobbing, and calling myself the worst things you can imagine. During the day I felt this incredible weight of sadness. It was only lifted by occasional moments of relief in the form of happy surprises and lucky turns. There are months at a time that I have zero recollection of; others will remind me about something that happened or a job I had and it will be a complete blank. Hope was a made up word. I could glimpse a good life, but assumed that sadness would hold me down until I drowned sooner rather than later. Fortunately after spending more than half my life unhappy I was finally able to make changes. It didn’t happen overnight, but I learned how to take control. That weight of sadness is gone. Even a few years after changing I am AMAZED that not only can I feel good, but I am not afraid. This post is one of many where I will share the steps I took to overcome depression, fear, and self-loathing. I hope it can help someone else on their journey to inner balance. Previous postBursting the Bubble of Corruption: A Nonpartisan Movement to Bring Democracy Back to the U.S.A. Thank you. It’s been quite a journey. I hope what I learned can help someone.